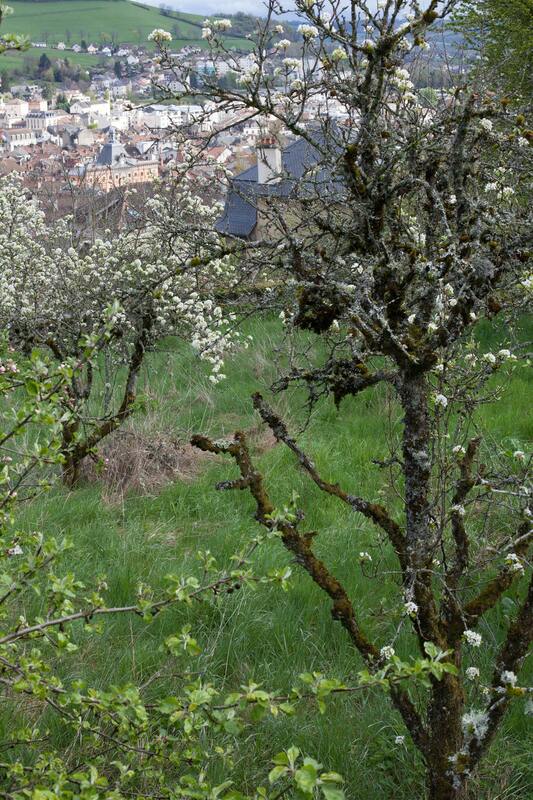 A mile away from “Le jardin d’Aurillac”, there is an abandoned orchard just in front of the university campus where students learn to “innovate and enhance the agricultural products of the region”*. 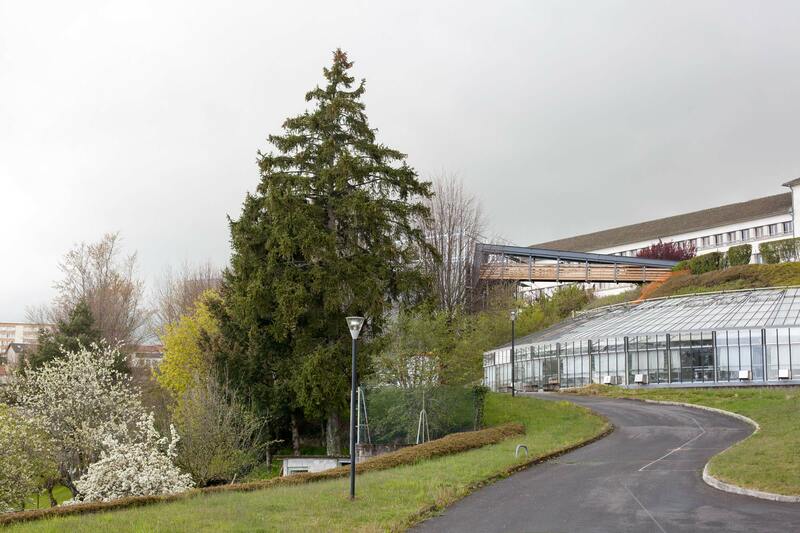 Right: the glasshouse where students have their biological engineering workshops at the Aurillac branch of the University of Auvergne. Left: some fruit trees in a rather good condition in a small private garden. Photo 26 April, Aurillac, France. On the other side of the campus, the left part of a much larger orchard that has unfortunately not been maintained for quite a while. Picture taken in front of the recently opened hall of residence: the trees are just in front of the students’ eyes. Although it is still producing fruit, this orchard is not a good example of a well looked after local production capacity! So, students who are taught to think locally are faced with neglect of the local. What sort of effect does it have on them? Most of the trees are in poor condition or have died. 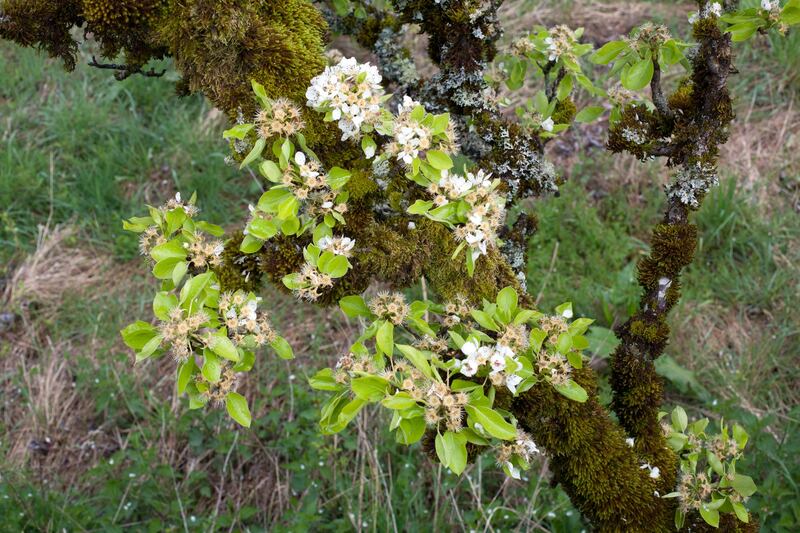 Would a well-maintained orchard be inspiring for students, by working as a motivating, empowering reference for them? As an education professional, my answer is definitely yes. View over the right part of the orchard from the hall of residence. 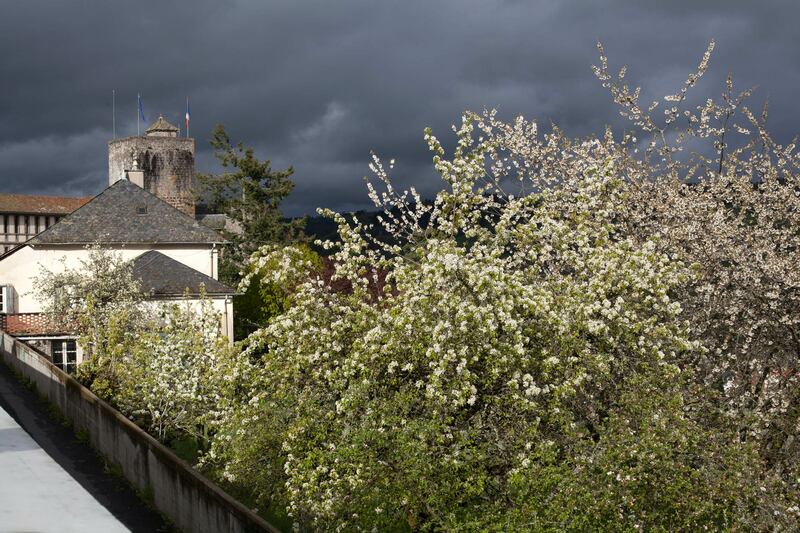 In the middle, the orange building of the City Council of Aurillac, which has recently adopted a zero pesticide policy in public spaces, like for instance Vevey in Switzerland (see our post “Jardins de Suisse”). I hope that the students are made aware of this environmental choice, of the consequences it has on the actual look of public green spaces and what citizens think of it. What a privilege for them to have a live laboratory just here in front of their eyes so that they can figure it out by themselves! 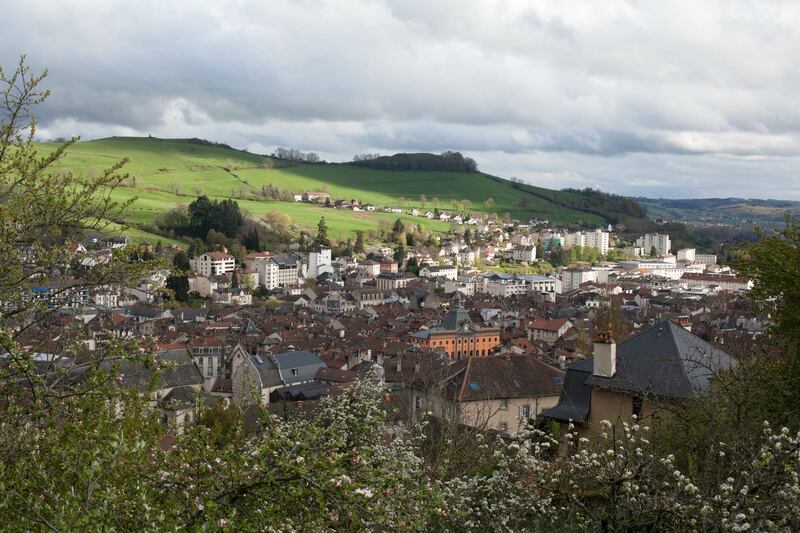 There are tidy productive gardens in Aurillac, like the ones I saw the week before in one of the richest parts of Switzerland. For instance this one, not far from the university (building top right). Let’s hope there will be more and more of these well-maintained places. Education, surely, has a big role to play in this, and we need to show students tangible examples of successful stories. The more local, the better. And if it could be just in front of their eyes when they open the window of their student rooms, wouldn’t that be compelling? * Course title, in French: “Licence professionnelle innovation et valorisation des produits alimentaires de terroir”, Institut Universitaire de Technologie, Génie Biologique, Université d’Auvergne, Aurillac. 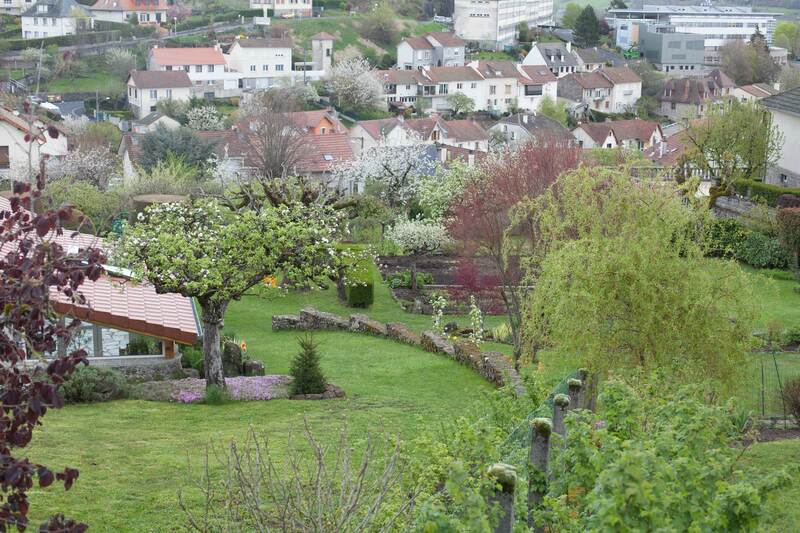 This entry was posted in Fruit for sustainable development and tagged Aurillac, Auvergne, France by Les Jardins d'ici. Bookmark the permalink.